As you all know, I have the 'Haterade' moniker on this web site for a reason. I am usually the lone dissenter in WLTI, and while other members of our group try to water the flowers, I bring to the party a vat of hydrochloric acid. I have always been the bad guy and I will probably continue to be the bad guy - but I do this because I want to be as fair and unbiased as I can to you, the viewer. So with this being said, it's on to ravage the show that everyone is going to laud over - and the one that I am going to get a ton of hate mail over - Game Show Marathon. Let me start by saying that I so wanted to like this show. I really, really did. Unfortunately, I didn't get a Game Show Marathon. I got a warped, watered down version of shows that I grew up with. I could write a short novel on why the first two shows made me sick to my stomach, but I will limit myself to 5 of them. 1. The Editing - Remember when Deal or No Deal's editing sounded like it came from a cave? Well, if Deal or No Deal was from a cave, then this was from Carlsbad Caverns. Besides the really choppy editing, we don't get to see Kathy Najimy's second putt from Hole in One (or two) and her whole deal from Let's Make a Deal. We also are not privy to why Lance Bass decided to not to go into the Big Deal. The strategy was sound (if no one wins the big deal, then he gets the finalist slot), but we don't get to understand it because it was edited out. Whoever edited the show was obviously not a game show fan, because those were just a few of the major nuances that we didn't get to see - but we should have. 4. Pacing - So I know that you have to stretch a 30 minute game into 60 minutes, but both TPIR and LMAD showed us all how NOT to do this. Would it have been too much of a crime to get rid of the bidding altogether and have all 6 people be able to play a pricing game? You could have spent time on each person, had 2 Showcase Showdowns and you could have gotten a lot more gameplay in. I also don't care how brutal Kathy's deal was - you really needed to get that segment in, because the game was just too stretched out. These are 2 examples on how better decision making and timing could have made a difference. 5. The lack of gameplay - How can you not know how to play the Race Game? How can you bid a dollar over someone's non-existent bid? How can you bid $88,000 on a showcase when the podium only has 5 digits? The gameplay was so bad and surreal, especially on the showcases, I expected Sure we are here to see celebrities play, but it helps if they actually KNOW the games. There are a whole lot of factors that made this show a disaster. When the woman who asks how the Race Game works and asks if Paige Davis (who wins a nickel on the Big Wheel) gets a prize for doing so manages to win the show despite being off over $18,000 from her showcase, it makes the show a satirical mess. This felt like a Saturday Night Live game show skit gone painfully awry. I expected Will Farrell to come out with Jeopardy after the show, and come to think of it, it would have been vastly more entertaining. If I have to be the lone person to say that like the emperor in the fable, GSM isn't wearing any clothes, then so be it. I'm going to have to give it a robe and an umbrella, to shield it from the Haterade rainstorm that will certainly be coming its way. 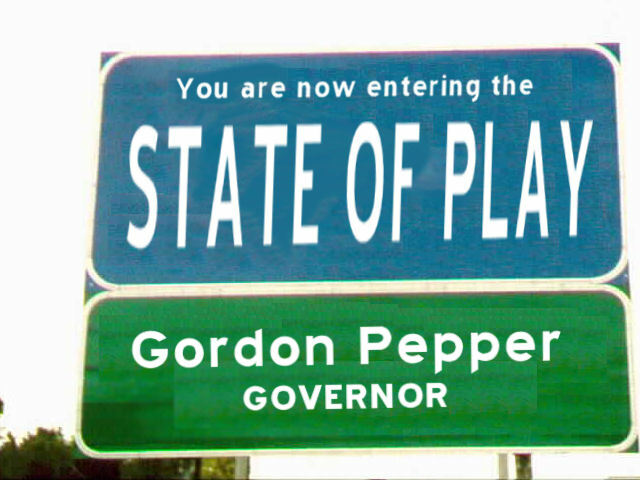 Gordon Pepper just needs a hug. E-mail him at gordon@gameshownewsnet.com.